It’s a bird! It’s a plane! It’s… a building? The latest from Geotectura and Malka Architects is a concept for Delft University’s Architecture Faculty- a flying structure called AIRchitecture that’s already making our heads spin. The campus building concepts combines a static learning center for libraries, offices, lecture halls, and an auditorium, with flying workspaces and off-site “zeppelins” to allow for more dynamic collaboration and exchange. This concept might sound crazy, but it is certainly a great example of a minimal footprint. 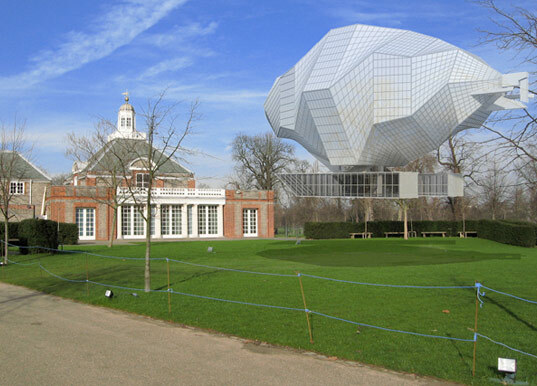 The studio spaces will be split between an off-site “floating building” with “plug-and-play” flying classrooms for minimal environmental impact, along with satellite “zeppelins” in locations around the world. The complex is to operate as an educational machine, providing the structure to support multiple programs, and a dynamic, kinetic architecture that inspires awareness and innovation for young environmental designers, “Learning through motion and arising the activist part of the student,” as described by Geotectura. 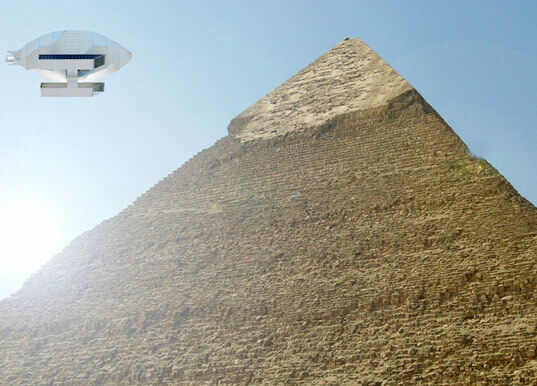 If you’re wondering about the mechanics of this UFO-type building, the structure of the zeppelin will be built from carbon and aluminum, outfitted with PV cells embedded within the skin of a balloon frame. The designers describe the experience as “More than a building – a way of life,” that will encourage architecture students to question everything. 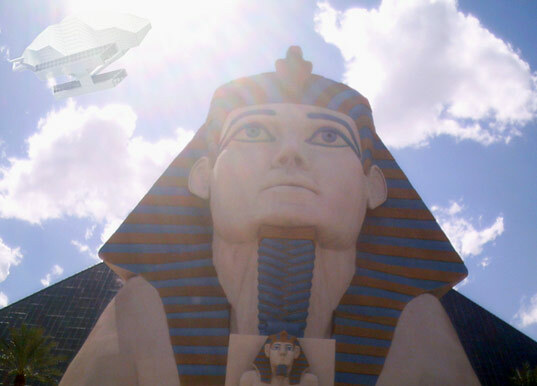 We don’t know why this flying building would be hanging out over Luxor Casino in Las Vegas, but we LOVE this crazy image! don't propose something if you cant make it work. ok, so if you thought this project is funny, you should visit geotectura's website at www.geotectura.com, some really wacky crazy idea's that frankly astound me. how would any of it work?! it is so funny, make it fly! it is so interesting and funny! make it fly ! it is wonderful! I know it's still in it's concept phase, but how will this thing fly? I also don't see why the balloon part (i'm not sure what it's supposed to be called) is boxy like that, how does it benefit the structure? I'd like to fly on something like this, if it someday actually works, but I'm sure it would be extremely costly. Looks like a great way to learn and travel. It's a bird! It's a plane! It's... a building? The latest from Geotectura and Malka Architects is a concept for Delft University's Architecture Faculty- a flying structure called AIRchitecture that's already making our heads spin. 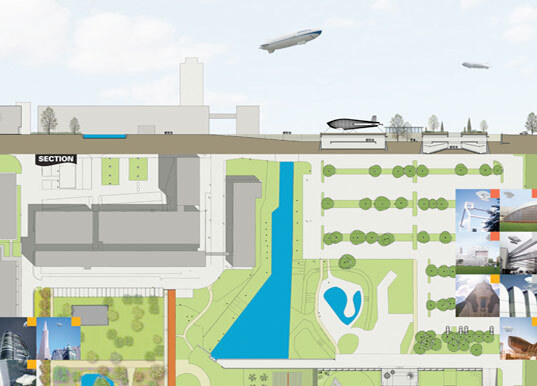 The campus building concepts combines a static learning center for libraries, offices, lecture halls, and an auditorium, with flying workspaces and off-site "zeppelins" to allow for more dynamic collaboration and exchange. This concept might sound crazy, but it is certainly a great example of a minimal footprint.